The device is connected as a HID keyboard/mouse as well as a network interface to accomplish this. The device is automatically configured and does not require any special driver installation. It supports Windows / Linux / OS X. There’s practically no defense to this type of attack other than physically securing your USB ports. The ALOA version is a successor to the original P4wnP1 which is still a very popular tool to use with a Raspberry Pi Zero W. The old version was very simple and could only deliver a payload and was basically a Pi version of the old “Rubber Ducky”. This is the alpha 1.0 release so there’s still some work to do to make things smoother and easier but this version is functional enough to start playing with. ALOA aims to do much more than its predecessors by having trigger actions and multiple scripts ran based on those triggers. This allows you to adapt to changing environments and execute much more sophisticated actions. On top of this, it is also a full Kali Linux distribution giving you all the power of Kali. This guide will help you get it installed and start experimenting with it. Let’s jump right into it! Kali Linux P4wnP1 Aloa. This is the image that comes prebaked with gadget mode which makes getting us up and running much easier. Write the image to your MicroSD card using your preferred method. There are several ways to connect to the Pi. My preferred way is to plug it into my computer and use the web interface / SSH to connect to it. I can then have the Pi connect to my home wireless and have an internet connection on Kali. Plug the Pi into your computer. If you are on Windows you will see a interesting notification that Windows is installing and configuring drivers for a “P4wnP1 by MaMe82”. We can change this later to whatever we want but it’s a good sign for now that everything is working the way it should be. This is the P4wnP1 ALOA web configuration interface. From here we can easily start configuring the device and begin to play around. In the bottom left of your screen click the “Working Mode” dropdown and change it to “Client with Failover to AP” like I have in the screenshot. The WiFi client settings will appear in the middle of the page and you can enter your home network information. Now hit the “Deploy” button in the top left and the Pi will apply your settings. Failover mode means that if the Pi can’t find or connect to your network it will start listening as an access point again. This makes it very easy to connect to the web interface when you take the device outside your home as it will fail to connect and start listening. The SSID and pre-shared key to connect to the Pi wirelessly are along the right side of the screen. It comes prepopulated with a SSID of: 💥🖥💥 Ⓟ➃ⓌⓃ🅟❶ and a password of “MaMe82-P4wnP1”. 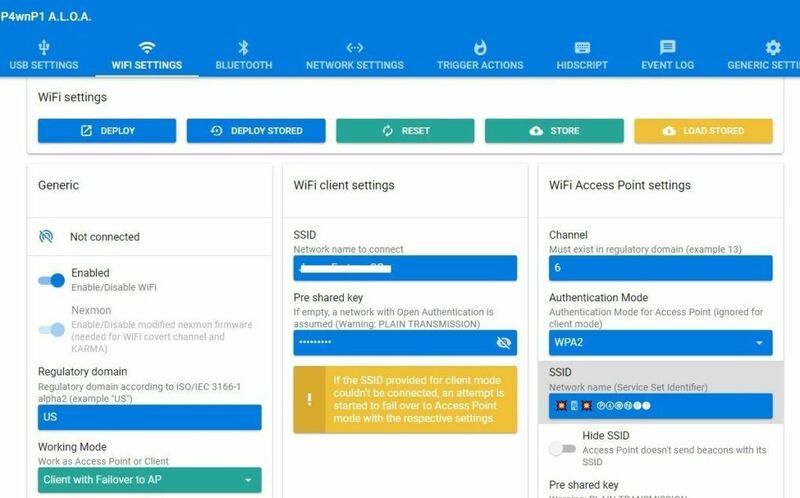 You can actually completely configure the Pi without connecting it to the computer by just connecting to the SSID wirelessly. It is possible to get internet through the host computer the device is plugged in to but it requires additional configuration on the host PC (we’ll cover that later). In addition to the wireless tab you have the network settings and bluetooth settings tab. You can click around these on your own as they are pretty self explanatory, but I will mention that it is also possible to configure the device through the bluetooth connection. Depending on the type of scripts you want to run it may serve you better later to connect over WiFi or Bluetooth so it’s good to know it’s there. Go to the USB settings tab next. This is where we can configure the behavior and identity of our device for when it is plugged into a host. On the left hand side of the screen you can configure all of the settings that control how the device identifies itself to the computer. You will want to change these because “P4wnP1 by MaMe82” is hilariously suspicious and likely already being detected by AV software. Pick some custom settings and make the device your own! On the right hand side of the screen we have the gadget mode configuration options. The top two options (CDC ECM and RNDIS) are network interfaces that the Pi uses to communicate to Windows/Linux/Mac. The middle options are related to HID. HID stands for Human Interface Device and appears to the computer as basically a mouse or keyboard. This is how P4wnP1 is able to send keystrokes and mouse movements to your computer. The computer thinks it is actually talking to a keyboard instead of our Pi. At the very bottom you have a “USB Mass Storage” option which can mount a CD-ROM iso or a emulate a small flash drive. Now that we understand that the Pi is impersonating a mouse and keyboard let’s go to the HIDScript tab and start having some fun. This is where we can write and load scripts that tell the Pi what to make the host computer do. Press the “Run” button. A script will run that will open Notepad and tell you Hello from P4wnP1 and move the mouse around. Notice on the right side of the screen you can see the job running with a red X next to it. You can cancel jobs here by clicking the X. This also has a log of jobs that have been ran and whether they succeeded or failed. Now try running some of the other examples included with the alpha release. There’s a lot of different programs including a “game” that opens mspaint and has movement keys to move around with. There’s a lot in these examples to help you build a HIDScript to accomplish what youa re looking to ultimately do with the tool. Trigger actions one of the key features of the reboot of this tool. HID scripts stem from the original Rubber Ducky tool that simply ran a script to deliver a payload when inserted into the computer. Although the payloads have got far more sophisticated over the years the way they work (and the limitations of it) really haven’t. They deliver a weaponized payload and that is it. We can see a lot of very useful triggers such as “service started”, “USB gadget connected to host”, “SSH user login”, etc. The actions are very powerful. 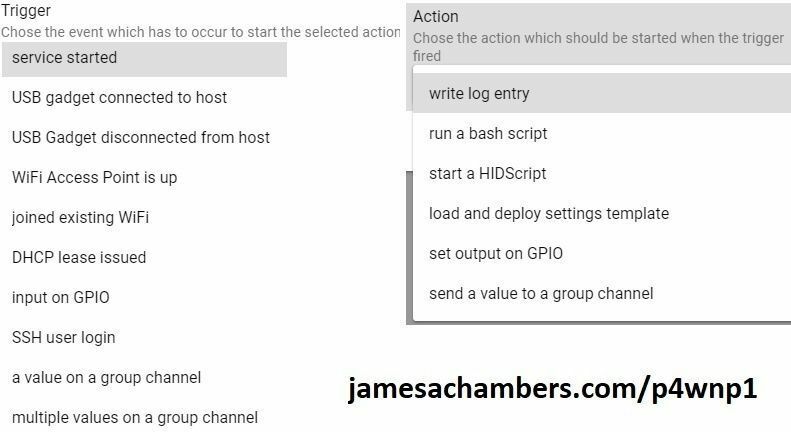 You can trigger a bash script, run a HID script to send a second/third/etc set of inputs, and even setting output on GPIO. With this model your Pi can actually have a conversation with the host. You have the chance to react differently to different situations that may arise during execution on different hosts. This is more like a dance than the previous payload delivery model. Of course you still have all of Kali Linux available to you from the Pi Zero. The easiest way to access them is to SSH in. To connect with SSH simply connect to the same address that we used to access the web interface on port 22. Log in with the default credentials of root / toor and you will be on the command line of Kali. If you connected to the internet by connecting to your WiFi via the web interface you will also have internet access from the Pi and be able to update. I recommend doing a apt-get update && apt-get upgrade to get all the latest packages and fixes. The author says in the README that apt-get upgrade should not break anything related to P4wnP1 and I was able to do it successfully. This will download all available packages for Kali Linux giving you a complete full installation on your Pi Zero! P4wnP1 has a feature that wraps all necessary HIDScripts and settings together called templates. This makes it easy to switch between different configurations without having to go change all the options one by one. The example that ships with P4wnP1 ALOA alpha is the WiFi covert channel attack. This is basically a port from the original P4wnP1 script of the same name and function. The attack launches a PowerShell window on the host and transfers/launches a script payload that allows you to control the host by connecting to the P4wnP1’s WiFi. This very powerful attack actually allows you to remotely control “airgapped” computers that aren’t connected to a network since the Pi itself becomes a wireless access point. Deploying this attack is as easy as loading the template and pressing “Deploy”. Note that you cannot connect through ssh on USB while running this attack since the USB interface is busy communicating with the host. You need to connect to the WiFi specified in the P4wnP1 wireless settings tab and then you can reestablish your SSH session. Before you hit “Deploy” make sure that the HIDScript for this attack has the right language for your country. The default for this one is US but if you have a different keyboard layout change it to your country in the HIDScripts tab. Some of these statements he makes here are a bit much. It’s not meant to be “weaponized” but it’s still called “P4wnP1″ and has the hilarious SSID title of”💥🖥💥 Ⓟ➃ⓌⓃ🅟❶ ” featuring emojis of a device exploding. Give us a break MaMe82! But I really like his final point he makes in the quote. This framework can be used to carry out all sorts of USB tasks in a way we haven’t seen before. It may not be too long before we start seeing USB drives capable of running many different actions based on triggers that are unique to each environment. The documentation is very lengthy but with this overview it shouldn’t be as overwhelming as the first time I went through it. Have fun! Can a simple USB-MicroB cable be used instead of the USB-A adapter board to deliver the payloads? Really interesting project and good article, I am building one myself. You can absolutely just connect a normal MicroSD cable to the computer! The USB-A adapter board is convenient since it makes it feel just like using a USB flash drive but it is not required.